FOR THE MILLENNIUM DEVELOPMENT WEST VANCOUVER EVELYN PROJECT PROFILE, PLEASE CLICK HERE. The Presentation Centre is now open every day except Fridays. Please stop buy to talk to a sales representative about purchasing a new West Vancouver luxury home here at Evelyn. This is a once-in-a-lifetime opportunity to purchase your dream West Vancouver home. Customer service is Millennium Group's strong point, and coupled with Jason Saprovich (an experienced and top selling West Vancouver real estate agent), the West Vancouver Evelyn homes for sale are expected to attract savvy homebuyers and sell-out during the pre-construction phase. Holiday greetings from Evelyn West Vancouver sales team! Wishing you the best during the 2009 Holiday Season. The second component of our presale West Vancouver Evelyn Presentation Centre has been unveiled! Showcasing luxurious German Eggersmann kitchens complemented with stainless-steel Miele and Sub-Zero appliances, Evelyn West Vancouver luxury homes for sale is a must see for anyone considering living in the Park Royal Village/Sentinal neighbourhood. Featuring three stunning colour palettes, the interiors at Evelyn West Van luxury homes celebrate natural finishes including granite, wood flooring, wool carpets, limestone and more - all in harmony with the elegant and timeless architecture inspired by Arthur Erickson. ESTATE HOMES 1 & 2 Bedrooms from $650,000 plus GARDEN HOMES 2 Bed + Family from $1.12M. Visit us today! Our Evelyn West Vancouver luxury home presentation centre is open daily 12-5PM, closed Fridays until December 20th. Please note that we will be closed for the holidays from December 21 - January 3, 2010, inclusive. Should you want to visit us during this time our West Vancouver Evelyn homes sales team is available by appointment and can be reached at 604.921.1010. Best wishes, The Evelyn Sales Team - 710 Keith Road at Taylor Way, West Vancouver, BC - t. 604.921.1010 | w. evelynliving.com | e. info@evelynliving.com. NOW SELLING - EARLY BUYER BONUS OFFER EXPIRES NOVEMBER 19* Discounted prices at the new West Vancouver homes for sale at Evelyn Living will disappear when phase 2 of our presentation centre is unveiled to the public. Take advantage of your priority registration status today! ASK ABOUT SPECIAL MORTGAGE OFFERS AND RECORD LOW INTEREST RATES! Thank you for your interest in Evelyn West Vancouver real estate 's finest community inspired by the legendary Arthur Erickson. Visit today to learn more about this amazing addition to West Vancouver real estate's prestigious Sentinel Hill nieghbourhood next to Park Royal Village. TH WEST VANCOUVER EVELYN GARDENS HOMES FOR SALE: PLAN A - An exclusive collection of private one level West Vancouver Evelyn Cliffside Garden homes. Open living floor plans with access to 700 sf south-facing terraces. Fabulous bridge views and outlook into West Vancouver real estate 's natural setting (most Evelyn Garden homes). 1516 sf starting from $1.12M. The luxury West Vancouver Evelyn ESTATES: PLAN A - Our one bedroom Evelyn West Vancouver condo floor plans are designed to be extra comfortable with real living spaces of 870 to 988 sq ft. sizes. Featuring Miele and SubZero appliances and German Eggersmann kitchens. 871 - 887 sf and starting from $650,000. PLAN B1 & B2 - These luxurious two bedroom plus den Evelyn Estate home floorplans offer a variety of layouts to suit each individual lifestyle and needs. Plus, these homes come with generous outdoor space, perfect for entertaining and patio/deck gardening. 1107 - 1218 sf starting from $819,000. The presale West Vancouver luxury homes PLAN C1 & C2 - This two bedroom estate home floorplan is perfect for sophisticated living - and designed with the house to condo downsize transition. Eggersmann kitchens featuring Miele and a fabulous SubZero refrigerator, the only thing missing is the yard work! 1108 - 1195 sf and starting from $889,000. The ultra luxurious West Vancouver estate home at Evelyn Living PLAN J & K - Our exclusive three bedroom Evelyn West Van penthouses feature palatial living spaces and large private entertainment sized terraces and more. Featuring breathtaking westcoast views of Burrard Inlet and the Pacific Ocean, the mountains and a sparkling downtown skyline (most homes). 1192 - 2063 sf and starting from $1.85M. LIVING AT EVELYN WEST VANCOUVER CONDO DEVELOPMENT STARTS AT $650,000. HURRY IN FOR THE BEST SELECTION. Our West Van Evelyn Presentation Centre is located at 710 Keith Road (at Taylor Way). For more information, please visit us online at evelynliving.com or call 604.921.1010. See you soon! The Evelyn Sales Team is Open daily 12-5PM, closed Fridays at 710 Keith Road at Taylor Way, West Vancouver BC - t. 604.921.1010 | w. evelynliving.com | e. info@evelynliving.com. *Some conditions apply. Please speak to an Evelyn Living Sales Representative for more details. Sizes, areas, specifications, views and prices are subject to change without notice. A boutique collection of prestigious estates, gardens and houses at the new luxury West Vancouver home development at EVELYN is now here. As their marketing reads: “True to the spirit of West Coast modernism, Evelyn offers a collection of sophisticated residences set at the heart of West Vancouver. Inspired by Canada’s Arthur Erickson, Evelyn celebrates nature in a village locale – a prestigious new address and elegant living environment, perfected by green design and the quintessential West Van lifestyle.” These luxury West Vancouver homes for sale are now previewing with presales starting later this year. Located just minutes to downtown Vancouver, homebuyers at the West Vancouver Evelyn development will enjoy effortless access to urban conveniences, an amazing array of recreational activities and a stunning outlook and views of the water and downtown. An inspiration by Arthur Charles Erickson combined with Nick Milkovich Architects and Walter Francl Architecture, the luxury West Vancouver homes for sale at Evelyn will never be surpassed in terms of location, floor plans and interior appointments. As mentioned in previous posts and from their marketing materials at Evelyn Condos, these new luxury West Vancouver homes for sale include several housing types that they market as Evelyn Estates, Evelyn Gardens and Evelyn Houses which are separated into to ares of the initial offering. Phase 1 of presales at the Evelyn luxury West Vancouver homes for sale features the ‘Gardens’ selection which includes Cliffside One, Cliffside Two and Cliffside Three clusters of spectacular West Vancouver Evelyn homes that are like garden estates. The second part of the initial offering at the Evelyn West Vancouver master planned development includes the estates at At Forest’s Edge One, At Forest’s Edge Two and the Townhome Collection. Whatever you choose, the North Shore homes are spectacular in every way. Phase 1 at Evelyn West Vancovuer real estate development will feature a total of 4 prestigious townhomes for sale in addition to 109 homes. Here is more information about the initial offering in Phase 1. West Vancouver home prices have taken a huge hit during the most recent global economic crisis, plummeting to levels not seen in over a decade. As one of the most prestigious and sought after communities in the Lower Mainland, the West Vancouver home prices are bound for a big rebound, especially when the world’s eyes will be fixated on the city during the 2010 Olympic Games. The well priced West Vancouver home prices here at Evelyn Living are not inexpensive, but they do reflect current market prices, especially when you consider the location, views, master planned communities and future amenities. Evelyn West Vancouver home prices range from six hundred and fifty thousand dollars to about two million, depending on the location and type of housing you are interested in. Homebuyers can expect Evelyn West Vancouver home prices to be comparable to other new developments in the area. Firstly, the Evelyn Gardens Estates homes will feaure two or more bedroom condominium floor plans with West Vancouver home prices between $1.0 million to $1.8 million for 1175 to 1850 square feet in living space. All of these Evelyn Gardens Esates have private terraces that are expansive, and the unique Plan B Garden West Vancouver homes have 1000 to 2000 square foot private gardens. 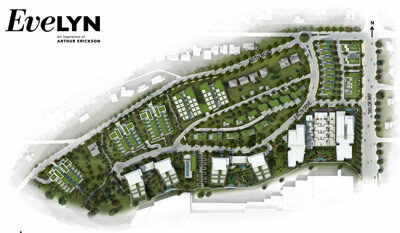 The Evelyn West Van Gardens estates are located in the clusters of Cliffside One to Three. On the other hand, there are the Evelyn Estates for sale at At Forest’s Ege One and Two in this initial offering. The pricing for these new West Vancouver homes are between $650k to $700k for 875 square foot one bedroom and flex floorplans, between $719k to $749k for junior two bedrooms (980 sf) and between $820k to $895k for two bedrooms at 1150 sf. The two bed plus den Evelyn Estates floor plans range from 1100 to 1200 sf and are between $850k to $975k. The three bedroom plus condominium homes at the Estates are very expansive and range from 1600 to 2000 square feet and are priced between $1.5 million to $2.0 million. These reflect current West Vancouver home prices (according to price per square foot of new condo developments). Last but not least, the project also consists of two bedroom and den Evelyn Townhomes for sale that are between 1697 to 1742 square feet over two levels with a garage in the basement and a den on the upper level. These homes are priced around $1.125 M. The West Vancouver home prices do not include GST or other closing costs. The Grand Launch was a Success! Buy at Evelyn Tomorrow! Thank you for your interest in Evelyn West Vancouver homes for sale! SALES START AT EVELYN TOMORROW, SATURDAY OCTOBER 3, 2009: 12 - 5PM. Please book your appointment as soon as possible - 604.921.1010 - Our Evelyn Condo Presentation Centre is located at 710 Keith Road (at Taylor Way).